Benefit from immediate savings of 15-30% in material costs each year! 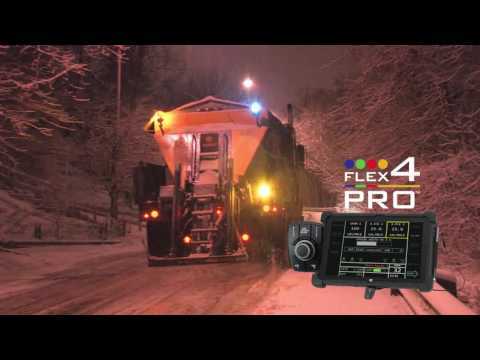 The Flex4 Pro™ is a complete monitoring and control system that provides precise, year-round, application of granular and liquid materials. Equipped with a ruggedized, 10.1” touch screen tablet that will handle harsh environments, the Flex4 Pro™ optimizes the user experience through both viewing and interaction. Operators can monitor up to four fully customizable operations at one time without the issues associated with smaller and lower resolution displays. In addition to the touchscreen display, the Flex4 Pro™ utilizes an operator switch module (OSM) in order to provide control at the drivers finger tips so he can maintain eye contact with the road. The OSM incorporates the system master (on/off) switch, spinner/ spreader width adjustment knob, rate increase or decrease, pause, and blast all in one convenient location. This CAN BUS design control system provides a wide array of features such as easy automatic valve calibration, section control, integrated cameras with reverse view, applied material data and driver log files while providing a platform for future feature expansion.